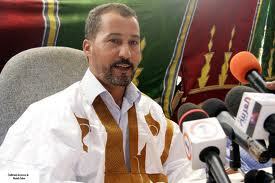 Sahrawi activist Mustapha Salma Ould Sidi Mouloud said on Sunday that he will remain uncompromising over his stances, despite the ordeals he has undergone, until responding to his legitimate demands of reuniting with his relatives in the camps of Tindouf, the Maghreb Arab Press news agency reported today. Ould Sidi Mouloud made the statement over the phone while talking to the participants in the first forum on the national issue which opened, on Sunday in Kelaat Sraghna, under the theme “civil society at the service of the national issue”. Mustapha Salma resumed, two days ago, his open sit-in in front of the headquarters of the UN High Commissioner for Refugees in Nouakchott (Mauritania) after stopping it for a few days due to a discomfort. During this phone call, he hailed the importance of such initiatives which give him with support during the hardship he is suffering for having taken the side of the population held captive in the camps of shame in Tindouf. He thanked the participants in the three-day meeting and lauded their solidarity with his cause. In April 2010, Mustapha Salma visited the southern city of Smara for the first time in 30 years, and declared that the Autonomy Plan presented by Moroccoin 2007 is “the ideal solution” to the conflict. On his way to the Tindouf camps, on September 21, he was kidnapped by the Polisario militia and imprisoned in the desert for 71 days. He now seeks to return to the camps to join his family but is being denied access.